I'm always looking for healthy snack alternatives and decided to create a recipe that incorporated "good-for-you" ingredients with a touch of sweetness. 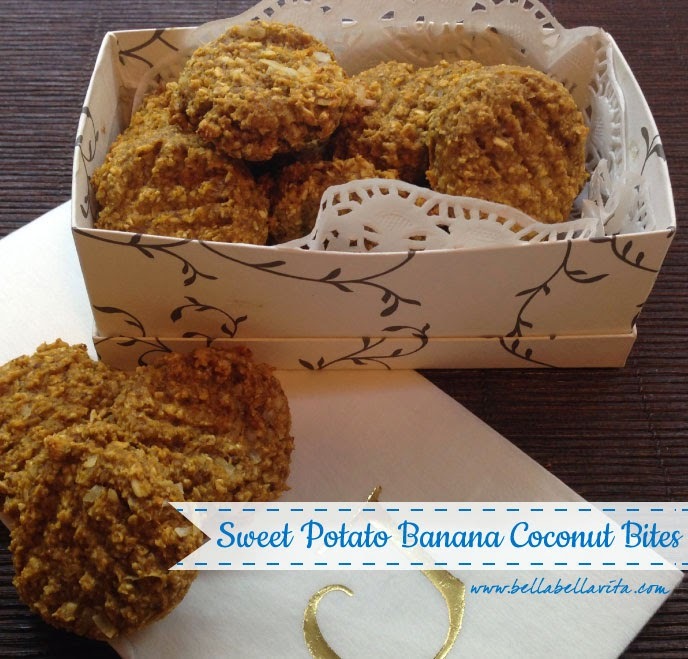 The result was this recipe for Sweet Potato Banana Coconut Bites that satisfied my craving. It looks like a cookie, but it's really more of an energy bar since it has lots of healthy ingredients to give you some fuel in the afternoon or late morning. And, I kept the added sugar to a minimum and you can always substitute the turbinado sugar for stevia. Hope you enjoy! Peel and dice sweet potato into 1/2" cubes. Place aluminum foil on baking sheet and spray with olive oil. Arrange sweet potatoes in a single layer and spray with olive oil. Roast for 25-30 minutes until soft. Reduce oven temp to 350º. Mix all dry ingredients (oat flour thru salt) together in a medium bowl with a whisk. Using a Cuisinart or Kitchenaid mixer, combine banana, sweet potato, sugar, molasses, egg whites, canola oil & vanilla extract; mix well. Add flour mixture to wet mixture a little at a time and mix until blended. Stir (or pulse) in shredded coconut. I added 1/4 cup, but would even increase to 1/2 cup, depending on how much you like coconut. Adding more coconut will make the bites sweeter. Refrigerate dough for 15 - 30 minutes. Scoop on baking sheet coated with cooking spray using small cookie scoop. Flatten with a wet fork. Bake 12 minutes. Cool on wire rack. Enjoy! I've also been buying regular oats and grinding them myself in my cuisinart. I like this method as well because I can control the fineness or coarseness of the oat flour. If you have the Paprika recipe app and would like to download any of these recipes, please email me and I'll send it to you in the correct format.